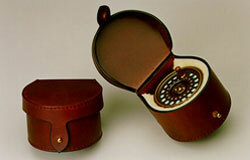 Time and time again, the fly fisher's search for the finest hard leather cases ends with Arne Mason of Ashland Oregon. Influenced by both traditional European hand stitching and western saddlery techniques, Mason has developed a distinct personal style. Characterized by tasteful classic designs and uncompromisingly clean, hand mitered French edges, Mason's work continues to set the standard by which the fly-fishing industry's leather work is measured. 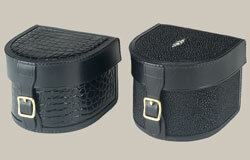 His leather is the finest grade A English Bridle tanned in the USA. English Bridle is the most durable leather, the interior is hot-stuffed with natural oils and the surface is waxed, making it the traditional choice for outdoor use. All sales are prepaid, Visa and Mastercard accepted. Allow 2-4 weeks for delivery. We do repair and restoration of antique leather cases. Contact Arne for details before sending items.